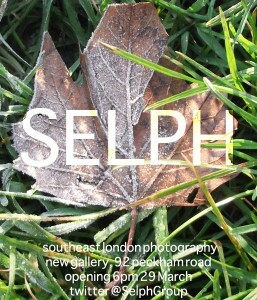 SELPH: innovative community photo group for people with experience of illness opens first exhibition in Peckham, 29 March. The Southeast London Photography Group opens its first ever public exhibition at 6pm Thursday 29th March, at New Gallery, 92 Peckham Road. The group offers people with recent experience of illness the unique opportunity to take photographs and use them to express and reflect on their experiences. It celebrates how modern media makes it easier than ever before to make and share images, and shows how this process of creativity and sharing can be good for personal and community wellbeing. None of the members are from a professional photography background, and all the pictures were taken with the same ‘one-design’ compact camera. Yet the images are inspiring, fresh and each photographer brings a unique perspective on Southeast London. The group runs as a voluntary collaboration between members, a photographer, social researcher and psychiatrist, and is supported by the Maudsley Charity. The exhibiton runs from 29 March to 5 April. All are welcome! For more information see twitter @SelphGroup.